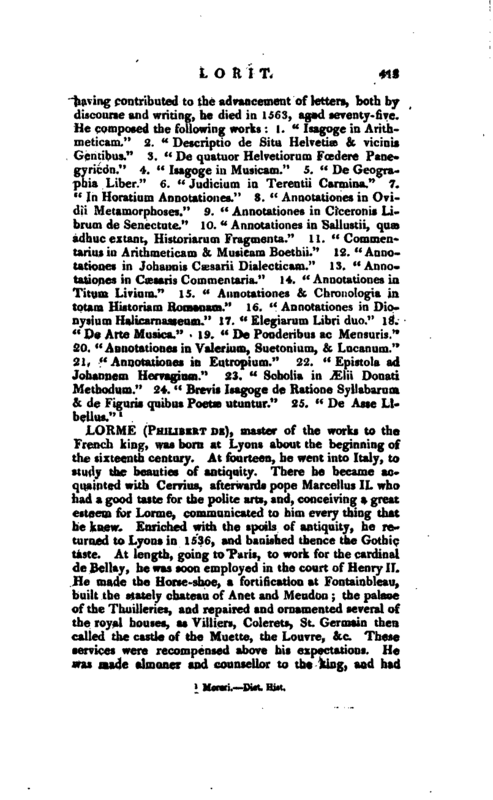 , master of the works to the French kin;', was born at Lyons about the beginning of the sixteenth century. At fourteen, he went into Italy, to study the beauties of antiquity. There he became acquainted with Cervius, afterwards pope Marceilus II. who had a good taste for the polite arts, and, conceiving a great esteem for Lorme, communicated to him every thing that he knew. 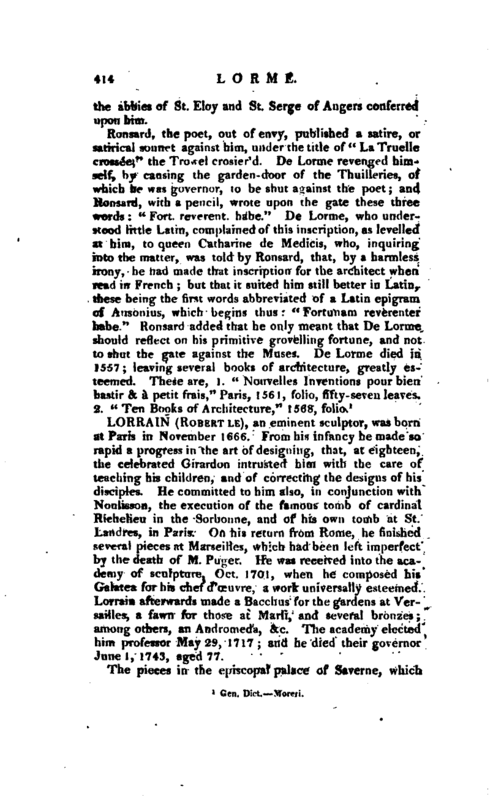 Enriched with the spoils of antiquity, he returned to Lyons in 1536, and banished thence the Gothic taste. At length, going to Paris, to work for the cardinal de Bellay, he was soon employed in the court of Henry II. He made the Horse-shoe, a fortification at Fontainbleau, built the stately chateau of Anet and Meudon; the palace of the Thuilleries, and repaired and ornamented several of the royal houses, as Villiers, Colerets, St. Germain then called the castle of the Muette, the Louvre, &c. These services were recompensed above his expectations. He was made almoner and counsellor to the king, and had | the abbies of St. Eloy and St. Serge of Angers conferred upon him.